The next edition of Dungeons & Dragons is on the horizon, and players have more options than ever to get their tabletop fantasy fix. It’s in this spirit that we present The Defenders of Midgard, available at DriveThruRPG and Paizo, with 7 outstanding new themes — and lots of other crunchy D&D goodness — made possible by the generous patrons of the Midgard Bestiary for 4th Edition. Designers Richard Green and Brian Liberge have really pulled out the stops for this one. 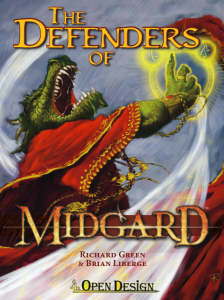 Pick up The Defenders of Midgard at DriveThruRPG and Paizo!